This compound is known in traditional folk medicine as a “blood purifier”, acting through the lymphatic, glandular and mucous membrane systems. Its primary action is to balance the processes associated with the breakdown and elimination of metabolic waste. It also enhances overall absorption and assimilation of nutrients. Suggested for all constitutional disorders having to do with the fundamental or core makeup of an individual, including processes involved in the breakdown and elimination of metabolic and catabolic waste, disintegration of healthy tissues, and slow reconstruction of new tissues. Specifically indicated for chronic congestion in all the lymphatic and glandular systems. Also suggested for chronic congestion of the mucous membranes including mucous membranes in organs, glands and tissues. Helpful in chronic constipation, arthritis, and chronic middle ear infections. Definitely indicated in the treatment of cancer. OS-22 comes in 1 oz. (30ml). Using 30 drops per day this bottle will last about 1 month. To be taken for chronic conditions only. 15 to 20 drops in a little water, three times per day, between meals. Drink plenty of water through the day while taking this compound. Do not take this compound if you are pregnant or nursing. Do not use for acute conditions associated with fever, infection or inflammation. For some individuals this compound may act as a laxative. If so, simply adjust the dosage. These health conditions can become serious. Promptly seek qualified healthcare if your symptoms persist, especially if you have a fever. Location: Cell Point A is located on the center of the breastbone, three finger widths up from the base of the breastbone. 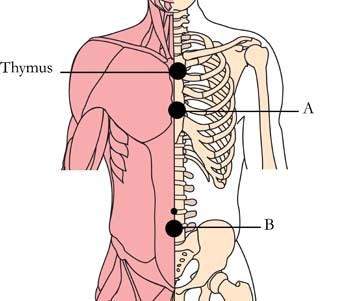 Benefits: This point strengthens the immune system and the internal organs. The Thymus is two to three finger widths below the collarbone. 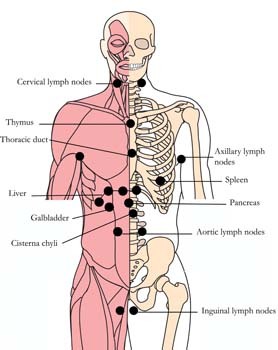 Benefits: This point boosts the immune system and the thymus gland. 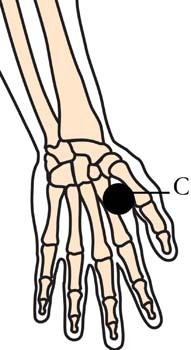 Location: Cell Point C is located on the back of the hand in the webbing between the thumb and index finger, at the highest point of the muscle that protrudes when the thumb and index finger are brought close together. Benefits: This point is the "Great Eliminator." Note: This point is forbidden for pregnant women because it can may cause premature contractions. Duration: Start Cell Point application when you begin using OS-22. Continue wearing the Micro-Disks for two to three days after symptoms have cleared. Reapply at the first sign of imbalance. This Tachyon tonic is an energy product of Tachyonized herbs known as blood purifiers that help with chronic constipation, arthritis, chronic middle ear infections, and cancer.